When discussing space the word depth often pops up. Depth is a term that I feel needs greater interrogation when discussing painting. I cannot help but consider depth (in itself the most hackneyed term for illusion) to be created as a result of tone which promotes recession or form, which is surely figurative. Recessive colour spaces are due to conditions which emanate from figuration, landscape and aerial perspective – the violet blues forming the mountains or different sizes of forms indicating distance and so on. “Space” is a much better term when discussing colour in abstract painting, in my opinion. I have become convinced that space as a condition hinges upon movement. In painting, movement can be created through colour relationship – not ‘colouring’, which is passive, or “colours”, which connect with a designed painting, but the reactive quality of any given colour or colours to any other given colour or colours within an orchestrated whole and, ideally, without a hole. It is not in the brushed mark per se which is a sort of trapped movement, and it can equally well be in the ‘area’ as long as it generates some sort of energy, a pressure, a luminosity through its characteristics and relational qualities. Maybe depth is ‘captured’ because it is premeditated, space is released because it is discovered? Abstract artists do not really know what exactly is happening when they are working (this needs a whole essay) – which causes a degree of irritation with some who keep trying to bring these probings in the dark back into some sort of contextual classification and fit everything into known prior achievements; it’s natural to want to compare but when the comparisons are shutting down the achievements of the work purely for an imposed contextual comfort blanket, the result is a lack of proper engagement and a closing-off of discussable possibilities. Art is not like that. It is much more of a wild animal. Depth can be controlled, space cannot. Movement is due to differences. “All lies in the contrast” as Cézanne said. Difference can come through so many factors, but it is conditioned ultimately in painting through colour. Facture will determine how we experience colour in a painting and facture creates detail – subtle shifts in paint quality create detail within differences of hue which in turn can maximise colour relationships. Concentrating on colour in this way can open up space. Subtle really does mean subtle too, it doesn’t have to be souped up or winged around, as it can also be clean, clear and precise. There is no hierarchy of technique or approach. The proof is always in the colour of the pudding. Adopting a reductive approach has been the driver of much so-called ‘advanced’ modernist painting, until post, post-painterliness or whatever post is past came along. The problem has always been the raison d’ȇtre – to condense or heighten are often used to describe and define such reductive methods. I’m not sure, with hindsight that this is completely true – with a few notable exceptions. I have prized the achievements of Morris Louis, for example, since a student, but not the “Veils”, nor the “Unfurleds”, as distinctive as the latter are (I always get a frisson of excitement when seeing one with its instant recognisability). The “Stripes” were the most significant works for me with their disinterested colours and great drawing. Those days are gone, though, but I do not think a throwing out of the baby with the bath water is the solution, as artists who have worked in reductive ways do exemplify the importance of specificity. Matisse was a precursor of this for abstract artists with his continual modification and finishing ‘hit’. Now would be the time to maintain that specificity but to find more engaging, ambitious, non-reductive approaches that create greater freedoms for the viewer; freedoms that also re-engage with the plenitude of detail and space when we simply look at the physical world. Stronger work needs, in my opinion, a real sense of organising and sorting out the wheat from the chaff or removing superfluous incident and delivering confident decision making, not reducing but strengthening perhaps – letting go of control and “giving oneself to the gesture” (Picasso) are not enough for me. There has to be more wilfulness without restrictiveness, rather than chance, which is a conformism in disguise. 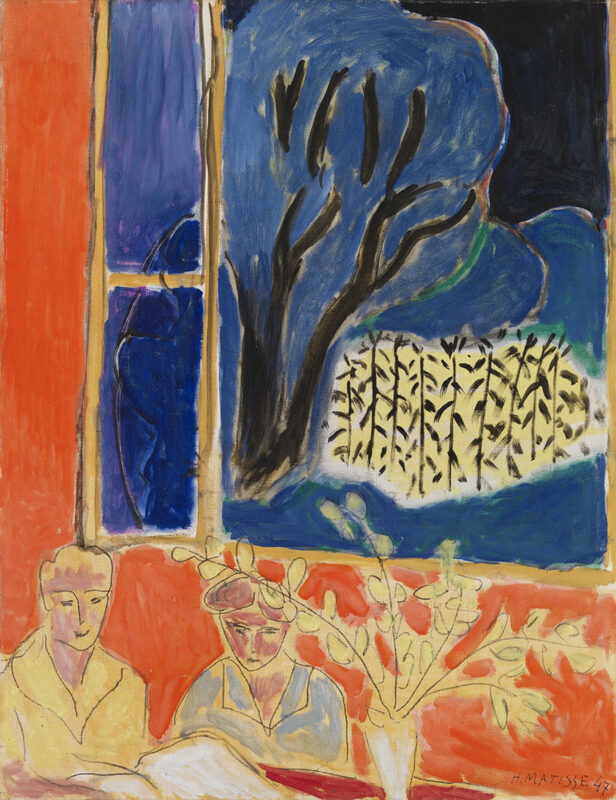 The Matisse illustrated is stunning not just in its colour and drawing or its ability to generate pictorial luminosity; they haunt me for their connection with how we see, too. When we look at the space in our physical field of vision, we can take it all in in one go, however complex it is. In this instantaneous moment, we perceive movement – not in an A to B linear way by following form to form, but as spatial differences evinced through colour changes which are determined through texture absorbed by our retinas simply by facing front. Far to near, we get it all and work it out (texture is detail – in painting, a perceived surface). How we create movement in an abstract painting determines the space and the quality of expressiveness – which can never be depended upon to reach a resolution just by “having a go”. For it should also be pointed out that (curators take note please) trying to make art will not actually guarantee that it comes calling. You would think that every artist written about at the moment is able to make exactly what they want with complete success – batting averages that make them the Don Bradmans of art. The last thing a curator wants is failed or compromised painting (yet the truth of the matter is closer to this reality than the endless streams of success that seems to be hogging the walls – maybe this is why such trivial things get so much space and column inches? This sort of ‘art’ never attempts anything meaningful, so it sidesteps being criticised for failing. Irony is cool, as we witness in the latest Britain’s Got Art show, which is connected by the thread of having a go. There are enough serious artists who thankfully challenge this mindset, although they are swimming against the tide. Information has become the lingua franca of art and like most texts these days it is pushed upon us rather than being something we seek so we become ever more indifferent towards issues communicated ‘at’ us; this forces outlandish positioning to make narratives have a more pressing urgency or relevance, and experience which was once at the heart of our engagement with art is relegated to the sidelines. “Have you seen” is morphing into “have you heard about”. I think (maybe hope) this desire for the superficial may be part of a wider phenomenon, the flip side of the current heavy horrors of ugly nationalism and all its manifestations. Are we seeing an inverted form of terminal lucidity? That moment when someone with a neurological disorder (without making light of afflictions such as this at all!) suddenly has a surge of clarity which fools you into thinking they are going to pull through when shortly after they don’t. Are we witness to a sudden coalescing of – hijacked – art forms into a parade of poppy notoriety when if we are patient things will return to a state of grown up rationality, and frivolity will be seen for what it is. Could this be the case with all this folly and anger? It would be nice for frivolity to play a role on the margins rather than centre stage – it’s a broad church after all. Is it just a matter of time until we can discover a new space in which better things can be enjoyed? I’ve just seen this Monet today and thought of Emyr essay on space. I know this is figurative, but the way it is built, so freely yet so intelligently, feels very abstract. Absolutely agree, and I think that applies to abstract sculpture too: and as far as this Monet goes, figurative painting can do that thing as well. And space is movement forwards and back, or across. Different phenomena in a way. Forward and back generated by colour relationships and type of shape/mark, across more reliant on shape/mark. But I understand the problem with this, and it can be challenged: this shape/mark is all to do with colour anyway. And the easy gain of simple and obvious spatial colour relationships. I’m not against this idea but there is something about abstract painting that seems to involve creating new worlds that are quite different, in some ways, from the world outside (worlds within worlds). In contrast I enjoy all sorts of physical worlds, some simple and some complex, but I rarely see a vista in the ‘real’ world that looks like the best paintings (certainly abstract, maybe figurative as well). That is part if the illusion (and point) of painting. Reading this again perhaps it relates to the possibility of painted new meaningful abstract worlds freeing us up to see the world differently? I’m all for this. This can happen all the time. People can be experts at spotting figuratve elements in any abstract painting, my aunt being one of the best. The issue really is whether it becomes insistent on the viewer as it will mess up all the spatial relationships. I think that although it may be the fault of the painter/painting it could be the fault of the viewer. I don’t remember seeing the torso. Carl Friedrich Gauss was a German mathematician and a child prodigy. Allegedly, when he was 7 (in 1784) his teacher set his class a time-consuming challenge: to add up all the numbers between 1 and 100 – He thought that would keep them quiet for a while. Gauss did something remarkable though. He added the first number (1) and the last (100) to get 101, then noticed that each of the following, respective pairs, 2 plus 99, 3 plus 98, 4 plus 97 and so on, would always add up to the same 101. Gauss quickly realised that there are 50 pairs in 100 so the calculation would thus be 50 x 101 = 5050. This quickfire answer astonished his teacher who was even more amazed when Gauss explained his method…. It’s absolutely brilliant and so simple and obvious when you think about it. No doubt there is a parable in there somewhere… a shortcut to making abstract space? Not that there is any such thing as abstract space, mind you. In Japanese tradition, the word ‘Ma’ is used to represent ‘gap’, ‘space’, ‘pause’ or ‘the space between two structural parts’ throughout different art forms, even throughout life. It is best described as a consciousness of place, not in the sense of an enclosed three-dimensional entity, but rather the simultaneous awareness of form and non-form deriving from an intensification of vision. The West has no such word or term. I agree with Robin, that the Monet painting of a railway station has tremendous space. Monet said: ‘I want to paint the air in which the bridge, the house and the boat are to be found – the beauty of the air around them, and that is nothing less than the impossible.’ Monet is painting how he wants you to read the painting, by moving around in the air to visit different motifs. Too many representational painters do not understand, or see space. When learning to draw, the term negative space is used, referring to the gaps in a chair for example. The word negative, as opposed to the positive chair, suggests something less important. For me, the areas of space are the most important, as they define the chair. Moving across and around the spaces, informs where each element fits together and how the chair is positioned in the room. Space is an illusion, just as light does not exist, it has to be created. In sculpture, music, dance or acting, space can be measured through time or distance. Space only exists because of identifiers or non-space, which tend to be marks and shapes in painting, metal/wood in sculpture, words or actions in acting. They move the person experiencing, across space. That movement can be fast or slow, dependant on the viewer. I came across an online interview with American artist Emily Cheng. Her paintings are very diagrammatical, while using areas of subdued colour, line, spots and drips. She explained her lines lead the viewer through a painting quickly, spots slowed down that movement. Drips she felt, were the connection to the painting process. I am not suggesting lines or spots as they are too literal, but we can be encouraged to move through space created specifically for that purpose. It is invisible to sight and hearing, yet artists can create such opportunities. Confusion exists in not having a specific word like ‘Ma’ for this special type of space. There is nothing to denote painting space, sculptural space and acting space, from the generic space that is everywhere. Should painting space be defined differently to sculptural space? Space within painting extends over a surface to the boundary. Sculptural space has one kind of space contained within all of the metal/wood, but for me, there is also an environmental space, that painting often lacks. Architectural space concerns the building and its interior/exterior, but also its relationship with the environment. Are the two spaces (within and outside) different, or the same? I would suggest sculptural and architectural space is present whenever the object is visible. Does that also fit with painting? Music is very similar to painting, as we experience both through one sense and usually from one position. How do composers include space, but more importantly the ‘right’ space? Space has to create interest and add to the composition of notes or marks of paint. Emyr: In your article you say: ‘Depth is a term that I feel needs greater interrogation when discussing painting. I cannot help but consider depth (in itself the most hackneyed term for illusion) to be created as a result of tone which promotes recession or form, which is surely figurative.’ I would suggest overlapping forms create the greatest depth in representational or abstract painting. The different perspective add to it. John McLean uses shapes, colours, placement and overlapping forms to create abstract paintings with space, both on the picture plane and as depth. In the video ‘Which Way Up’, John talks of positioning shapes, so the corners or points move the eye around a canvas, often across large spaces. I have recently read your book ‘Abstract Painting and Abstraction’. You briefly mention space. The images used to demonstrate, I find limiting in the extreme. To simply apply tone all over a canvas and then paint shaped areas around and filling the outside, does not address the issue of creating space, but for me, highlights the limitations of abstract painting. Manet and Van Gogh looked at Japanese prints, Matisse developed a pictorial space by studying Oriental painting, it was highly organised and formal. There is nothing flatter than a Japanese print, yet so many create space across the surface, but also depth from overlapping forms. When you look at Hokusai’s giant wave, it conveys so much space, from a relatively small image. Size is not the issue. In Cubism, they sacrificed colour for the abstract qualities. When wanting abstract painting to be so specific, other areas will have to be surrendered. For abstract purists, space may be one of them. Space is associated with and an effect based upon the real world. Can there be abstract space within painting, without the movement such space creates, as it would then render the act as representational? I don’t know, it is something I am offering to ponder. Can there be abstract space, or is all space representational? Abstract painting, on the whole, wants to remove depth as it can create an illusion associated with representation. The other way to create depth is through overlapping forms; and again frowned upon by abstract purists. Horizontals are considered landscapes, verticals are figures and diagonals suggest depth, circles the sun or moon, so all that is left are random amorphous, or purely geometric shapes. Within painting, it would seem the abstract purists have backed themselves into a corner. The only way they can create ‘space’ is through the placement, colour and shape of marks, though for abstract painting, colour, size and shape have to be carefully considered to eliminate any suggestion of depth or figuration. Light colours we associate with space, where blues and yellows also have figurative connotations. Some artists therefore, only use synthetic colours, opaque and often without any mixing and of the strongest hue, so they cannot be read as naturalistic. As for layering, many abstract painters do work with layers, though the ultra-purists would not. From all of those restrictions, some want to develop space. ‘You put a blob of yellow here, and another at the further edge of the canvas: straight away a rapport is established between them. Colour acts in the way that music does.’ Georges Braque. Our eyes connects both blobs. Because we look at the whole and focus on the centre first, any movement towards an edge will open out a painting. Linking ‘body’ and ‘edge’ marks has one type of movement and quality, those placed near an edge have an added quality, that tension between the edge of a mark and the edge of its canvas. When the quality and thickness of marks/lines repeat over a canvas, regardless of the colour(s), they will close space. Emir: I find your recent paintings act like carpets of coloured marks. We logically look for association. When a canvas is filled with specific shapes or marks, they will be read as a whole. Working within any additive process, there is the potential of closing space. Whether it is painting or sculpture, crafting space is about directing the eye and for any viewer to experience a journey (without necessarily recognising it). Easier said than done, but that is the challenge. Space and movement I am exploring at present in my own paintings. Interested in specific environments, space is what enables us to see and move through a physical space. Within any art form, space can only be recognised, when you move across, over, or around it physically, or perceived. The more you look at a painting like Monet’s railway station, the more space you experience; the space between motifs, the space between colours, even the space between brush marks. Taking the recent exhibition of Robin’s sculptures and Gary Wragg’s paintings, different ‘space’ needs to be considered. I usually find Gary’s paintings have a space running throughout them. Much of this is due to the drawing qualities of paint and variety of marks. As for Robin’s sculptures, they have sculptural space within each of them. For me, they also have space around them to the extent of the gallery walls. Then there is a spatial dynamic of being hung with several similar works. Shapes and materials in one sculpture also contained in other sculptures, will have an additional dialogue. A piece of wood in one, will interact with all other pieces of wood in the same sculpture, as the viewer recognises them as having an association. They will also interact in a similar way with the other sculptures, forming links with the materials, shapes etc. In such an exhibition, there may also be dialogues between the sculptures and paintings (lines, curves, mass). Each association, creates movement and space. That to me, is the essence of good art, in going beyond what it fundamentally is. In Japanese Buddhism, their set of elements, the godai; includes Earth, Water, and Fire, but Air and Void are used rather than Wood and Metal. That is what we are talking about, different elements. For what I have referred to as space, is it air, void, or both? I don’t think I mentioned the phrase abstract space? I talked about the role of movement inducing space in subtle ways – they are not separate to me either; it’s how movement is generated that fascinates me – differences through detail is something I am proposing here as a facilitator (detail not details). I didn’t mention space in the book so much as it was written over 2 years ago and one’s thoughts and work develops and changes, also I did not feel any need to say everything I felt at the time or could remember in one go anyway. Surfaces in books are glossy and colours misleading too – not that I am defending my work, but I have never made a painting to demonstrate an issue and if a work is placed on a page it may not always be directly connected to the words below it. I think I actually wrote something explaining that in the book too. I had an editor who also advised me on its content and indeed its language as an early chapter draft was rejected as being too specialised and “not commercially viable” for them- who knows I may get asked for a follow up and I’ll put something in that. Thanks for the plug though – it’s reasonably priced and available at all good online retailers. John Mclean has been a good friend of mine for over 30 years and I am very familiar with his ways of making pictorial space – I have several of his paintings in my house which I enjoy on a daily basis – he has a few things of mine too. I felt a degree of literalism and indeed an anger running through your words, which is a continually disappointing subtext in so many threads. Also I seem to remember a previous comment by yourself , and in another of my articles too, about becoming an abstract painter later in life and figuration being part of our subconscious (it is not part of mine). You said abstract artists were insecure too, yes? I think abstract artists (and all good artists) embrace doubt which I do not see as being insecure. I am full of doubt but very secure in my commitment to my painting and what I demand from it. I handle paint and I look at colour; things happen, I respond and make more things happen. What I identify as the more significant things happen when I have put in long, long shifts, which is both re-assuring and tiring – it gets harder too as your ambition goes up every time. Painting space IS surely different from ‘generic space that is everywhere’, as its paint. I do not see space as an ‘illustratable’ quality (Robert Bateman paintings which you championed before do not have space in them in the way I am trying to get at – they rely on depth cues) . Hokusai’s Wave doesn’t convey any space that I know of or have experienced in my life either- it generates its own space through its relational elements within the limits of its size and surface and the fantastic handling of materials evident (his printmaker or him is unimportant) – none of which limits it as an excellent work of art – indeed it wouldn’t be any better or have more space if it were bigger. He was an amazing artist and it’s remarkably synthetic stuff. I appreciate the time you have taken to respond here and at length, but I am not convinced I have communicated my meaning to you in the way that I wanted to get across. At some point I will work on a part 3 and try to win you over then perhaps! By the way Robin, the Gauss story was to draw attention (in a flip way, I suppose) to the value of the “obvious” especially when imagination is attached to it. I am increasingly drawn to the obvious in my colour and that of others.The Matisse at the top is built with the primaries which it’s not as easy as it may look – as indeed he, in the great book on his work, “With apparent ease” is at pains to point out. Just to return momentarily to sculpture – I thought, looking at my work today, of a kind of opposite way of thinking about the space thing: namely, that rather than trying to make my sculpture “spatial” by including more and more actual space (or indeed, thinking of the space in the sculpture as another material to be articulated, which has been postulated in the recent past when we started to talk much more about space in abstract art, but which I now think is a non-starter); that instead I wondered if it made more sense to think of keeping the quotidian space of the room OUT of the sculpture, to not allow it in, not allow it to dissipate the movement – and the very particular spatiality – of and “within” (not a good word) the sculpture itself. This seemed to satisfy a few problems for me, such as the relationship and difference between the space inside and outside the sculpture. So now I could regard successful “spatiality” in sculpture as a very different thing from merely incorporating lots of space. As mentioned in a recent feed, the big, open constructions I was making a few years back (like the big floor-piece at Deal) “took in” loads and loads of actual, real, literal space, only to lose coherence in the sense of three-dimensionality at its fullest. I wonder if there is a kind of equivalent in abstract painting – but I’m only just now getting into it. Maybe it’s this – that when the space is sufficiently bound up with the surface it can only be where the painting is and not spreading out beyond. Emyr – When I worked in the Hamburg ship yards, (making sculpture), the workers used to (inevitably) ask “what’s that ?”. Once one of them saw the piece I was doing and promptly named it ‘Kalbende Krote’ (crouching toad); so there you are, so much for abstraction ! Re ;’sculpture space’,- perhaps ‘physical space’ as compared to painting’s ‘illusionist space’, would be the way sculptors think ? If one thinks of ‘space’ to be as is water, and IN it, you experience the physical pressures, movements, currents,, pushings, pullings, pro gravity, contra gravity, etc. If sculptors ‘see’ space physically, maybe they can learn to USE it physically ?. I think we should be careful about turning previously neutral terms like “depth” into value judgements. If “depth” is to mean something like “bad space” then we are missing a word for the illusory third dimension of a painting. “Depth” is familiar from the “height, width and depth” of a furniture catalogue. “Space” is what results from the simultaneous occurrence of these three dimensions. I think I can imagine what Emyr means by “depth” in a negative sense. For me it suggests an isolated patch of depth-illusion that doesn´t extend to the picture edge. Others might see this differently. Just saying “depth” and “depth is bad” sort of kills the argument before it gets started. I think it would be better to keep “space” and “depth” as the neutral descriptive words of normal language and then talk about what might make depth and space in a painting unsatisfactory. The same applies to “composition”, which as a neutral word is useful to refer to how a painting is put together. The negative, judgemental sense in which it is sometimes used here is, I think, better expressed as a contrived or boring or clichéd composition. There are a lot of interesting ways in which the composition of a painting might be unsatisfactory. Just pointing and saying “ugh – composition!” doesn´t help anyone. I would go further and apply the same sort of argument to “figuration”, of which there are degrees and varieties, some of them, in my opinion, unavoidable. It is surely more interesting to discuss whether the figurative element in a painting is more or less obstructive to its abstract intention than just to say “figurative” as a kind of knock-down argument, or to deny that there is figuration because it doesn´t get in the way. Sorry that this comes so late. These are thoughts engendered by the recent Brancaster discussions, but relevant here I think. I’d go on to say that I can’t think of an example where – in my opinion – some kind of figurative idea or motive or suggestion intruding into one’s appreciation of an abstract painting is of advantage to the work. You’d have to give examples and reasons to convince me. That’s not to preclude artists using it, or to diss paintings from the past that mix in semi-figuration, but only to state my own preferences and where I think the best potential for progress lies. I said a long time ago that space in painting must of necessity be a kind of representation or reconstitution of real space, but beyond that is a whole world of possibilities for each painting’s specific spatiality that in my opinion will not need to rely to any degree on figuration, intentional or inadvertent. Further, I think it is really easy to avoid the problems of abstract painting by sliding sideways into figurative references. There is lots of bad painting that does that. Well, you know all that anyway. But since you bring up Brancaster, I have to say that I really enjoyed seeing your paintings last weekend, and when you yourself mentioned in the talk that there was a figurative “subject” to some (or all?) of them, it made no difference one way or the other to me because I couldn’t see it. We could move this discussion to the Patrick Heron article; I wonder if you would really see the drawing in all the garden paintings as an advantage even when it is overtly figurative…? I’m afraid I don’t. When I first looked at your paintings I thought they were noticeably figurative. On the second day of looking I saw them as abstract paintings..and much was said about them by the group as abstract paintings.. Sometimes I get the feeling that the theories of your work( and other painters) could be going in advance of what is actually happening in the making of a painting ,which may be going in a different direction. And as they reach wholeness and ‘find’ resolution can become abstract? I’m happy to conform to an agreed usage, but can’t a painting be well or even originally composed? If “composition” is the naughty word, then what is the word to use when a painting is put together in a new, interesting, vital, convincing, unexpected way? I’d hate to think that my paintings have a “subject” but I hope that they have space. It’s that space which, as you say, is a “reconstitution” or illusion of real space, and which tends to reflect back into the content (by which I mean the literal marks, forms, passages, clusters and colours), giving abstract content figurative associations. At that point there may also be content that is more or less figurative in itself (unintentional tree shapes and the like). If this content fits, then I’m quite happy to keep it in. It’s not an advantage, but trying to do away with it altogether is an unnecessary (and external) restriction on the freedom to paint purely with colour and form, which to me is what abstract painting is all about. It’s like Anne seems to be saying and Emyr implies (?) in his essay – if the painting is adequately resolved and works as a whole then the abstract/figurative thing ceases to be an issue. I think that this is what happens in the best of Heron’s garden paintings. The word “built” springs to mind, with its less premeditated, optical and graphic associations and its more haptic and physical implications. But see my latest comment on Geoff’s Heron essay. I like ‘structure’ as it has a relational aspect. It can also affirm the value and status of the art object itself. ‘Built’ implies process and an additional one at that and painting wil often involve destroyIng what is there. But I’m not entriely against it: I often use the term ‘built’ as the way a human being ‘builds’ a life: our identity doesn’t come fully formed or even something to find inside of us and express. Similarly the making of an art work can also be an open and dynamic process. While I understand some problems with ‘composition’ I don’t see it as a great problem if it relates to the work’s structure. If it refers to the artist’s process it becomes more problematic.